HI, I have been trying to add my form to facebook but when I select 'Add Jotorm Tab' nothing happens? And it is not a pop up issue! 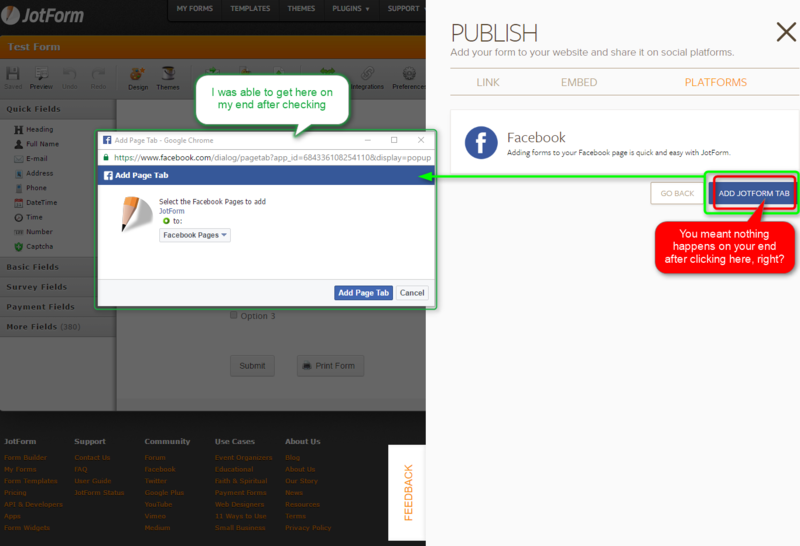 Do you mean you are using our publishing tools to add your form to facebook but upon clicking the facebook > add jotform tab nothing happens, correct? I've tested this on my end and I am able to get there with the Add JotForm Tab opening up my choices for adding to my facebook pages. I've cleared your form cache, can you please try this again and let us know if this problem reoccurs? If it does then please let us know what browser|browser version you are experiencing this problem. Additionally, you could try it in another browser to see if the same thing happens or not.